SAN FRANCISCO and SEATTLE – June 9, 2011 – ECOtality, Inc. (NASDAQ:ECTY), a leader in clean electric transportation and storage technologies, today celebrated the installation of the company’s Blink® Pedestal charging stations at Qwest Field Stadium, in Seattle. Politicians, local stakeholders, EV drivers and ECOtality executives will gather outside the stadium to commemorate publicly available charging stations in the Puget Sound region as of The EV Project. Qwest Field will host four Blink Pedestal charging stations in the North Lot and 2 Wall Mount chargers in the Event Center garage. 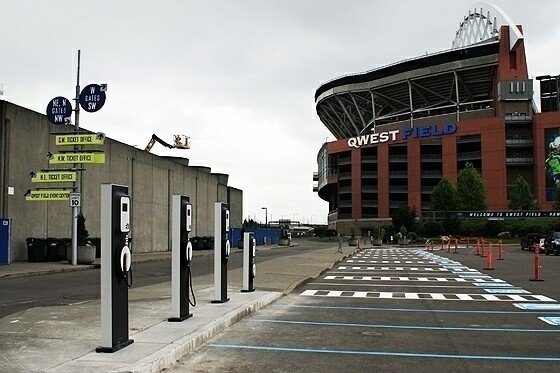 “Charging stations like the one at Qwest Field represent our first step toward a greener, cleaner transportation future. In the not too distant future, Federal investments in public-private projects like this will return immense rewards and really revolutionize the cars we drive and what fuels them. It’s appropriate that some of the first charging stations in the nation are here in Seattle – we’re a city of innovation and have a track record of embracing the future”, US Congressman Jim McDermott. ECOtality began installations of its Blink Level 2 Residential Charging Stations in EV Project regions nationwide in December 2010, and since then has completed more than 1,200 installations. The company recently began installation of Blink Pedestal chargers in commercial and publically accessible locations over the past few weeks, and held celebration events earlier this week in Arizona and Oregon. As part of The EV Project, ECOtality aims to have all public and commercial charging stations installed, including approximately 1,000 units in Washington State, by the end of the year. Locations for the commercial charging stations were selected using ECOtality’s Micro-Climate™ planning process, which took into account a variety of factors including traffic patterns and the locations of employment centers, regional attractions and retail hubs, as well as the input from more than 10 regional partners. McKinstry, a full-service, design-build-operate-and-maintain (DBOM) firm specializing in consulting, construction, energy and facility services, installed the Blink charging stations. The company also designed and installed Qwest Field’s solar system, low-flow water fixtures and high-efficiency lighting systems. ECOtality is currently in discussions with public and private property owners for installations of public charging stations in the Puget Sound region, and has announced pilot programs with national retailers including Sears, Fred Meyer, Macy’s, BP/Arco, Cracker Barrel and Best Buy for The EV Project. The Blink Pedestal is a level 2 charging station that provides intelligent, user-friendly features that intuitively and safely charge EVs. They include an interactive color touch screen and web-based media delivery via the Blink Network. Anyone will be able to charge at Blink charging stations utilizing a Blink InCard or by becoming Blink members. To obtain a Blink InCard, visit the Blink Network website at blinknetwork.com, or contact the Blink Customer Support Center at 888.998.BLINK (2546). Businesses in the Pacific Northwest Region that are interested in hosting Blink charging stations should contact Rich Feldman, Northwest Area Manager at ECOtality, at [email protected], or by calling 206.659.7072. This release contains forward-looking statements within the meaning of Section 27A of the Securities Act of 1933, as amended, and Section 21E of the Securities Exchange Act of 1934, as amended. All forward-looking statements are inherently uncertain as they are based on current expectations and assumptions concerning future events or future performance of the company. Readers are cautioned not to place undue reliance on these forward-looking statements, which are only predictions and speak only as of the date here of. In evaluating such statements, prospective investors should review carefully various risks and uncertainties identified in this release and matters set in the company’s SEC filings. These risks and uncertainties could cause the Company’s actual results to differ materially from those indicated in the forward-looking statements.